This IBM Redbooks publication will help you install, manage, and use PDSEs. 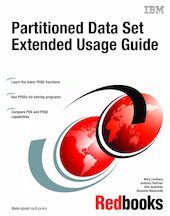 It is a substantial rewrite of the Partitioned Data Set Extended Usage Guide, SG24-6106, which was published in March 2001. It brings the originally published material up to date and includes enhancements made to PDSEs since the original book was published. The book describes how to define and use PDSEs, and shows how PDSEs offer improvements over ordinary partitioned data sets, such as sharing between users and systems with integrity, an automatically extending directory, and reuse of space. Information for storage administrators and systems programmers includes system-level information about sharing in a sysplex, the use and definition of non-SMS PDSEs, and how to diagnose problems with PDSEs. The advantages of using PDSEs for storing executable code are explained.